Knowing my love for all things Post-It note, Marty sent me this link yesterday via IM. Well... That's a relief... I was afraid I might find out I was Stanley. You are the kind of person that everyone likes. You are funny, laid back, and not bad looking. You love practical jokes and having a fun time with your friends. However, because you are so laid back you often let the things that are most important to you get away. I miss Dwight. Congratulations Universe, you win. "Because right now, this is a job. If I advance any higher, this would be my career. And if this were my career, I'd have to throw myself in front of a train." Arrr! With the Pirates again! Yarrr! * So if was a pirate, this is what ye'd be callin' me! 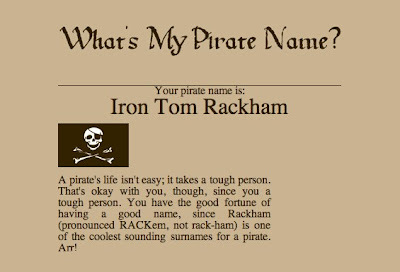 Take yerself over yonder and meet ma' brother... Captain Harry Rackham. * - I actually prefer "yarr" to "arr"... Personal preference only. Just want to jump on the bandwagon to remind everyone that today is International Talk Like a Pirate Day! Yar me hearties! Just wanted ta be lettin' ya know that we be talking like pirates terday! Get yerself over ta be lookin at the TLAPD website if ya be havin any questions. Be lookin' at this here instructional video if ye needs ta learn some pirate speak! Ummm.... Thanks to Marko for pointing out that the video is possibly rated PG-13. (ht to Marko's blog, and all the tweeps who have mentioned TLAPD this morning). 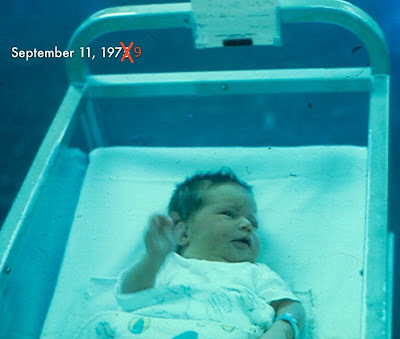 Marty pointed me over to the Sarah Palin Baby Name Generator this morning. Who knows, Plank Castle Palin you just might be president one day! (ht to Marko and Marty). My crazy long weekend started on Thursday evening. I took Jenn to P.F. Chang's for her birthday, where the Chang's Spicy Chicken was most excellent! Then we stopped at Graeters in the mall for ice cream, wandered around Easton for a bit, made a stop in Target and headed back for the ranch. By the time we got home it was well after midnight. Jenn baked cookies for college care packages, and I fished out some laundry and re-organized my backpack for the road trip. I think Jenn made it to bed around 1:15, and after getting all of my stuff together I ended up sitting up and reading until sometime after 2 AM. Friday and Saturday were completely filled with a quick road trip to Wheaton College outside of Chicago. Marty typed up an excellent play-by-play post of the road trip here so if you want to know more I suggest scoping it out. Getting back late on Saturday night made for a short night before a long day on Sunday at RVCC. I had the privelege of playing bass for Marty as he led worship at both services, which I thought went really well. Steve's message was an amazing start to what is sure to be a great series on the beatitudes. On Sunday afternoon I stayed at RVCC for our Discover River Valley class, which is our version of a "new members" class... It is basically a crash course in RVCC history, and why we do things the way we do. Youth on Sunday night was small group and we chatted and played a few games which was very uncomplicated, but a good time. I obviously failed at getting this posted yesterday morning... When I started putting my thoughts down though, I was my desk, at the office... There was no electricity at work most of the day yesterday due to the high winds and storms of the weekend, so most of the day was spent in the dark with no AC and no coffee maker. I am at work again now, taking a few minutes to finish this up before lunch. Tonight Jenn and I are going to see the Lion King on broadway at the Ohio Theatre in Columbus. It should be fun. We also have a home football game on Friday night, followed by a Fifth Quarter which we need to get plans nailed down for early this week. Other than those two big ticket items I suspect this week will be fairly "normal". I have notes from a meeting last Wednesday that I need to type up and get mailed out to our Youth team. I also have blogs to work on, and a lot of personal reading I would like to accomplish. I started reading The Shack on Sunday afternoon last week and finished it on Thursday night after we got back from Jenn's birthday dinner. It is an incredible book, and I'm still not finished mulling it over. I am hoping to start Rob Bell's new book today if I can get my hands on it. Friday after the game we had another very successful Fifth Quarter with the cooperation of some of the other Waverly churches. It is great to having churches working together in the community for the good of the students! Getting home late on Friday, I slept in some on Saturday morning and then spent a whole day of supreme laziness at home with the kids while Jenn attended an Emmaus team meeting and did some shopping. We were so lazy that I didn't even make the kids change out of their PJ's. We had a great day of just loafing around the house though, watching TV, movies, playing on the floor, etc. I need days like that more often. Sunday was a full day at River Valley. I found Steve's message about measuring the day to be one of the best one's in this current series, and worship with Marty Ford is one of the best parts of my week. We did some relaxing on Sunday afternoon and grilled burgers for lunch, just in time to make it back to the church for a massive photo-scavenger hunt at Youth. Great stuff! Look for the photos on facebook (and later on this blog!). Well... I have now officially worked on this post from five different locations, and am now back where I started... the recliner in my living room. Well... I have a crazy busy week at work with 101 projects to work on. Jenn has "water aerobics" (hehe) on Tuesday, we have a Youth planning meeting on Wednesday (to plan activities, etc for all quarter), and Jenn's birthday is Thursday for which we are going out to dinner. I may be going out of town this weekend, which would mean leaving Friday morning and coming back Saturday evening. This coming weekend is also the Men's Emmaus Walk in Chillicothe, which means I have all the little pre-Emmaus weekend things to wrap up before Thursday. I also have two other half-finished blog posts that I need to wrap up. I started reading The Shack on Sunday afternoon and am completely sucked in... The book was a recommendation from the friend of a friend who said it is a must read. I'm hoping to knock it out this week and then get back to some non-fiction. I'm totally swiping this idea from Terrace Crawford's blog. Here is the entirety of his post from July 17. Anyway... more on that later. Here's the deal... I never go anywhere without my iPhone. Period. I'm completely addicted to being connected. Sometimes this is a problem (more on that later as well). There is one more thing, and this is where Terrace's comment struck me. I never go anywhere without my backpack**. Now, if you know me or see me around you know about the backpack already. It is huge, and I take it everywhere. I have post in the works explaining the backpack. Maybe I will get it posted tomorrow. I've always wanted to do a post that needed footnotes. * - that list of five items (plus my phone) are what I have on my person anytime that I'm wearing blue jeans and a pocket t-shirt, which is my normal M-F 7:30 am-6:30 pm attire. If I am in weekend or evening attire (which means I've traded my jeans in for shorts) then I typically put the moleskine, the pocket-knife, and the tooney in my backpack. ** - I felt the need to explain the comment "never go anywhere without my backpack". For reasons which may become apparent later, the backpack can't go with me everywhere. It obviously goes to work with me, stays at home when I'm there, and rides in vehicles that I ride in. I can typically access the backpack within a few minutes from wherever I am. Anyway... What do you never leave home without? Unlike Alan Creech, I actually enjoy the word meme, and am determined to use it in conversation now that he has recalled my attention to it. Alan posted this meme on his blog with an open invitation for anyone who wanted to take part, so I am partaking in the fun, and encourage you to do the same. Here are my answers for December 5. 1484 - Pope Innocent VIII issues the Summis desiderantes, a papal bull that deputizes Heinrich Kramer and James Sprenger as inquisitors to root out alleged witchcraft in Germany and leads to one of the severest witch hunts in European history. 1933 - Prohibition in the United States ends: Utah becomes the 36th U.S. state to ratify the Twenty-first Amendment to the United States Constitution, thus establishing the required 75% of states needed to enact the amendment (this overturned the 18th Amendment which had outlawed alcohol in the United States). Mr Einstein, welcome to the United States. Farewell to Alexander Dum(b)as(s) - Thank you Shawshank Redemption. What does the W reveal about your birthday? Post links to your posts about this in the comments! So... if you didn't already know, Silas broke his leg. Jenn blogged it here and here. Today (day three of the broken leg) he is adjusting to the cast, but still very grumpy about his loss of mobility. His unhappiness definitely expresses itself the most when he is trying to get to sleep in the evenings. He just can't seem to get comfortable with the cast on and is very whiny and grouchy when it is time to call it a night. I was sitting in the recliner last night, holding Silas and chillin' when Jenn got home from water aerobics (*cough-cough). Jenn went to the bathroom and rushed back out into the living room to inform me that the bathroom floor was flooding, the toilet was running, and she couldn't tell where the water was coming from. I handed off Silas, turned off the water to the throne, and started feeling around to discover that the two bolts which hold the toilet tank onto the base had almost completely rusted through and water was running out one of those holes. Jenn did some quick internet research to determine that those bolts, along with an entire toilet tank repair kit could be picked up at Lowe's fairly cheap, so planning to do that this morning I went ahead and completely disassembled the can. 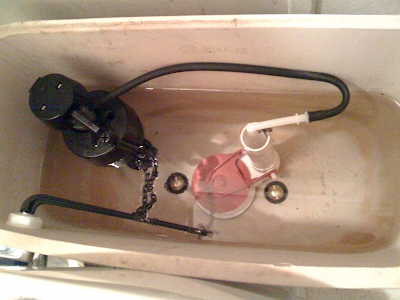 Who knew that completely gutting a toilet could be so easy. A few bolts here, and little twist there and pretty soon you're left with an empty porcelain box with a few holes in the bottom. The toilet is working again! I took Friday off from work to create a four-day weekend between two four-day work weeks. Friday we didn't do much except bum around the house all day. Some friends stopped out on and off through-out the day, and I stayed here with the kids while Jenn went and did the major grocery run for the month. Friday evening we went to the Waverly home football game against Jackson. It was very hot, humid, and crowded at the game. The football team lost to Jackson, but the band did a great job! After the football game we had a Fifth Quarter event at Grace UMC here in Waverly. The 5Q was a joint effort between three of our area churches, and was a great success! The Luke Francis Experience did a great job with the worship and Zack Pfiefer did a great job with the devotion. After getting home and to bed really late on Friday night, we all slept in on Saturday and then had another day filled with mostly just hanging out around the house. I made chicken fried rice and crab wontons for lunch on Saturday. The wontons were good, but the chicken fried rice is the best batch I have ever made here at the house. We went to the Waverly soccer game on Saturday evening, and after the game a couple of the Youth guys came out to play some Mario Kart and hang out. Sunday morning we were at RVCC for both services and then came home for a lunch of left-overs and a nap before going back into town for Youth. For Youth we went down to Walnut Street Park in Waverly and grilled hamburgers and hotdogs and played on the playground. It was a great evening, perfect weather for a cook-out in the park, and the evening was filled with great conversations, fun fellowship, and building relationships with our kids. While we were at the park Silas bumped his leg coming down the sliding board and hasn't wanted to put weight on it since then. He doesn't act like he is in pain at all when he is sitting or laying down, and played on the floor last night quite happily. However, whenever he puts weight on his leg he whimpers holds onto his calf. He doesn't have any swelling or bruising, so we decided to wait overnight to see how he treated it this morning. Since it still hurt him this morning, Jenn packed him up and took him to Adena. Since it is a holiday weekend I don't have to work today. I'm hanging out at the house with Ellie while Jenn is taking Silas to the hospital. At this moment I'm sitting in my recliner with my laptop and we are watching a movie. I've promised Ellie that I will make her a chocolate milk when this post is done. Because of the holiday weekend, I have a short week at work this week... Fabulous! Other than the normal work type things, Jenn is starting water aerobics this week on Tuesday and Thursday so I will be at home with the kids on those evenings. We're fixing brinner tonight for one of the Youth who is moving off to college this week. Looking forward to hanging out with Caitlin and hoping that the good-bye won't be awkward. I can't think of anything that I am particularly procrastinaing about this morning. There are a couple of books I would like to read, which I haven't managed to break into yet. Maybe I will have time to get on those this week. I am still trying to make it through Jesus for President, and I started reading Blue Like Jazz by Don Miller this week. I have to admit that I picked BLJ back up as a result of Don Miller's prayer at the DNC last week. I have read BLJ once before, and it really didn't excite me or keep my interest. Only two chapters in this time I wonder what I was thinking. This is great stuff! Excited for the short work week. Hopeful that the weather will stay cool, and that fall will actually get here and stay.